I thought maybe he was crazy, but he's wearing a jacket. Normal people don't wear jackets just to stand on a corner and pick their noses on a Sunday morning, do they? HEY. I'm not saying that it doesn't happen in America, I've just never seen it so blatant and prolonged that I am able to get my purse out of the back seat, dig my camera out of its disorganized interior, fish the camera out of its case, fumble with the power, adjust the flash (wouldn't want an inopportune bright light to expose my covert operation), and snap a photo of said public offense. And after all that time as our evidence shows, he was still going after that magic booger. Will this be the search to end all searches? I doubt it, but I hope he found what he was looking for. Tracie - send me an email on my promoteitaly email. I have received a press pass to the anteprima of vitigno 2007 but I will not be in Naples at the end of the month. You could be our press rep! great dave! i know, it MUST have been the booger story. 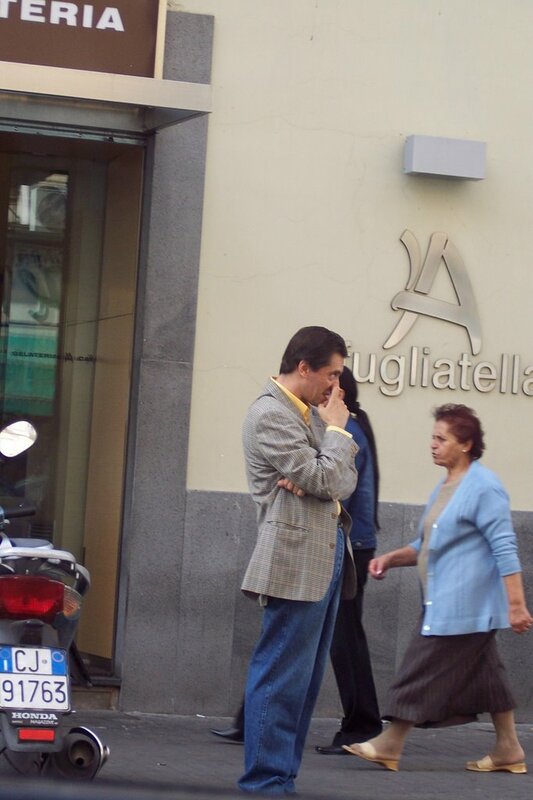 yeah, italians seem to have no shame about picking their noses in public... very disturbing! What did he do with his boogers after finding them? My Dad must be Italian. He's always picking his nose in public. yeah - I've noticed italian men seem to have no shame in picking their noses in public. I mean they really dig in. What I find amusing is that they (the ones i know anyway) will hold a napkin up in front of their mouths to pick their teeth with a toothpick, just agast at the thought of doing it covertly yet out in the open - but have no shame in picking their noses with no cover at all. LOL ??? This type of behavior is not indicative of the majority of Italians, and discussing it in this tone only reinforces inaccurate but all too prevalent stereotypes. Just my two cents. "yeah, italians seem to have no shame about picking their noses in public... very disturbing!" E X C U S E M E? I've lived in Italy for 35 years and I never saw anyone doing it in public... unless you're talking about 3 year-old italians!! You should have shouted out to him. That would have really been funny. anonymous--i wish i could say the same. eviva the non nose-pickers! by the way, i think every culture (regional, national, etc) accepts, or rejects certain benign habits. for many italians, as stacy said, using a toothpick to clean your teeth without some sort of barrier (hand in front, napkin, etc) is considered disgusting and rude. i was not familiar with this before i came because in america one can pick one's teeth openly. is it possible that an italian would come to america and be amazed at our indecency for allowing others around us TO SEE what we're doing with our toothpick? yes. because what is acceptable for one, is offensive to another. but who's right? who cares! calling this a stereotype and being offended by a perceived generalization (note that i did not characterize this as typical, just odd) is elevating this topic to an undeserved level of importance. and we all know that there is nothing IMPORTANT going on in this here blog. First of all, there's a lot IMPORTANT going on in this here blog or I wouldn't be reading it. Second, though I know you did not mean to paint stereotypes and I would never question the respect that you have for Neapolitans and their culture, the intention does not negate the effect, which is the reinforcement, though be it subliminally and unintentionally, to those in the Anglo phonic world, that their cultures' stereotypes that the southern Italian is crude, dirty and unrefined is accurate and true. It's amazing how up in arms people get about nose-picking! Who would've thought that this topic would be so provocative? Pat's over here writing an essay(with big words and all) on the effects of the booger blog on the "anglo phonic" world. We're talking boogers people! Lighten up!! It's funny. oooooooo!!! It sounds like someone got their toes stepped on. Do we have some offended booger baggers out there. I surely hope that they are defending all the Singaporeans we used to see almost everywhere we went get their daily limit. Gosh that sounds crude. Maybe I shouldn't say it or uuuh write it or uuuuh even think it. ooops darn I just hit the send key. Please accept my apology. hey anonymous, you aren't my dad are you? because i lived in singapore in high school and that was a frequent topic of discussion among us. we ALL noticed that of all public places, the metro inspired more nose-picking than any other. on the list of yucky things one SHOULDN'T do in public however, stamp-licking was absolutely in the top five. hmmmmmm!!! Could I be your Dad. hmmmmmm!!! Could be??? By the way when I look down below this space I see the word Blogger. Why does the term Booger Blogger come to mind???? See what you have started. Your Singaporean PaPa. hehehe dare I ask if you waited around to see if he... welp what he did with it? lmao!!! Ah, but with Italian fashion being what it is, I have no doubt that crazy would wear a jacket here. Oh, hilarious. It's your very own, private Seinfeld episode! Just want to wish you a very Happy Thanksgiving! Buona festa! Happy Thanksgiving cara tracie b.! happy thanksgiving to y'all too! Happy Thanksgiving Tra. Miss you. I always wear a jacket. Does that make me a bad guy? Not to be more disgusting than the nose picking, but what about the male adjusments that go on in public? I don't know about other parts of Italy, but have seen it a few times in the northern part. Ann... what's wrong with that?! seeing the foto, I my mouth started to water (not because of the succulent booger that guagliò was working on).... mmmmm..... sfogliatella!!!! Nnapule c'teng tant'!! Ok...I have been looking online and in my Italian/English dictionary, but I just cannot find it. How DO you say booger in Italian? When I look up Caccola it translates it as bugger. So is that really the same a booger? anon--nothing's better than attanasio, though! jennifer h--i think booger is muco. caccola would maybe be an idiomatic use...i haven't found a satisfying equivalent, though! I know that moco is booger in Spanish...so I guess muco is as close as I can get.